*Any variety of pork chops may be substituted, but if using thin chops (less than ½-inch thick), cook time will need to be adjusted down--approximately 4 hours LOW, 2 hours HIGH. Trim ribs of any excess fat. Heat oil over medium-high heat in a heavy skillet. Mix the salt, pepper and garlic powder; sprinkle over pork. Brown pork well on both sides; place in crock of a 5-6 quart slow cooker. Mix sauce ingredients in a small bowl and pour over pork. Cover and cook on LOW 5-6 hours, HIGH 3-4 hours--times are approximate as each cooker will cook differently. If a thick sauce is desired, remove ribs to a serving plate and keep warm in a 200 degree F oven, turn cooker to HIGH (if you cooked on LOW), and heat until sauce begins to bubble. Mix the cornstarch and water and stir into sauce, stirring constantly to avoid lumps. Cook for 5 minutes. 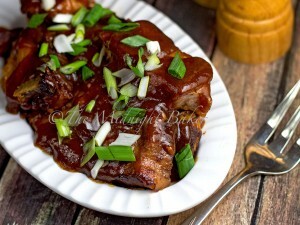 You can return the ribs to the crock pot to coat with sauce if desired. Otherwise, ladle sauce over ribs on serving platter.